Experimenting with several ways to get a good loaf of French bread without using my bread machine, I am ready to share this version over all I tried. It has a chewy crust and a beautiful fine grain. While my bread machine version (see "Useful Links" below) takes only about 5 minutes of active chef time, this recipe requires perhaps 35 minutes in measuring, kneading, shaping and cleanup. It’s a good one for a day you’ll be at home several hours doing chores, and can keep an eye on the proofing (raising) time of the dough. 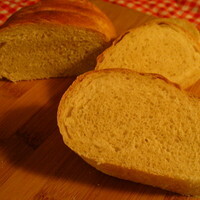 To feed a crowd or take to a pot luck, I’d resort to the bread machine recipe linked here. But for a beautiful impressive loaf of French bread for a special dinner, I’d take time to make it this way. This recipe makes a one-pound loaf of bread, 12 to 16 slices. Double if you have many mouths to feed. Stir in salt and 1 cup of the bread flour to make a soft dough. Spray large bowl with vegetable spray; place dough in bowl, turning dough to grease all sides. Cover bowl loosely with plastic wrap and let rise in warm location about 1 hour or more until doubled in size (see Photo 3). Punch dough down, place on lightly floured bread board. Cover loosely with plastic wrap and rest dough 10 minutes. Shape dough into an elongated loaf shape smoothing the top and tapering ends. Place on an uninsulated cookie sheet that has been sprayed with vegetable spray, and (optionally) sprinkled with a few pinches of corn meal. Spray with cool water and allow to rise uncovered, about 45 minutes until nearly doubled. Meanwhile place an 8" or 9" square pan on bottom rack of oven; add HOT water to 1/2" from the top; heat oven to 475 degrees F.
When oven has reached 475 F. carefully cut 1/4" deep slashes diagonally across loaf at 2" intervals with sharp serrated knife. Spray loaf again with cool water and place immediately into oven. This looks great! Thanks for doing all the work for us, by testing other recipes. I like this. I like french bread with my coffee.